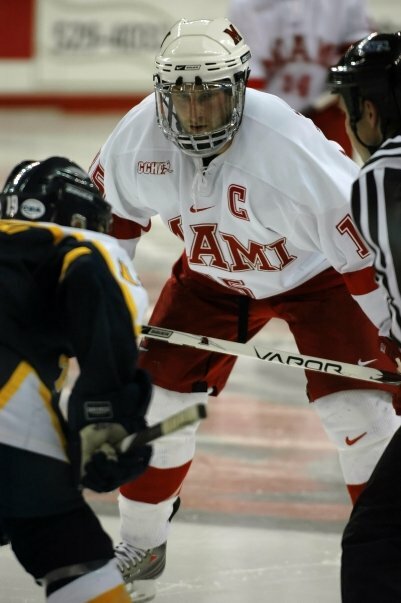 >The offseason signings continue today, as forward Bill Loupee has signed with the expansion Allen Americans of the Central Hockey League. Those local to the greater Cincinnati/Miami Valley area may recognize the name Bill McDonald, an associate coach of the team. He spent the past two years as the head coach of the Dayton Bombers and coached former Miamian Nino Musitelli. Lopuee’s signing makes him the fourth player signed by the team, as GM/Head Coach Dwight Mullins has already signed three players that played last season for McDonald in ECHL Dayton. The Americans will play at the newly constructed Allen Events Center in Allen, Texas. – A banner raising ceremony looks to be in the works at the beginning of next season to honor the team’s accomplishments and participation in the Frozen Four. 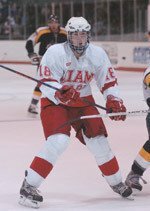 – Former RedHawk defenseman Alec Martinez was said to be in attendance at last night’s banquet. Thanks again to all who e-mailed with a recap! >…and another season of Miami hockey comes to a close. First and foremost, a big congratulations goes out to everyone involved with the hockey program. The coaches, equipment/training staff, media relations, off-ice officials, Cady Arena personnel, everyone…and especially…the players for being a part of something very, very special. Going into this season, most expected and considered this a “rebuilding year.” With a great first half of the season, the team had a rough start to the second half and eventually missed a trip to post-season action at the Joe. 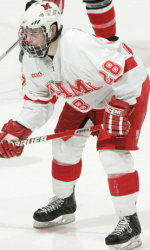 They had the second best power-play and the best penalty kill in the CCHA. Considering the team had a young blueline, two freshman goaltenders, and a lot to replace offensively, making the NCAA tournament was a great reward for the squad and gave the younger players some great “big game” experience. The Frozen Four weekend was something very special to be a part of and although the end result was so heartbreaking, I for one am extremely proud of this team’s effort. They gave Boston a run for their money and it says a lot about where the program stands. Although the last minute of regulation will be fresh in the minds of many for quite some time, the underclassmen will build off of this experience and be even more hungry for a national title in the seasons to come. It was hard, personally for me, to see our senior class go out the way they did. 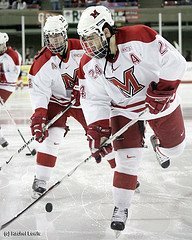 They should be proud to be a part of the winningest class in Miami hockey history, with 106 wins. This senior class was exceptional. 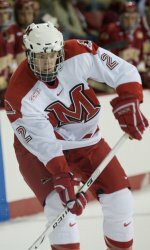 They were the first class to be ranked number one in any sport, the first class to win an NCAA tournament game, the first to 30 wins in a season, the first to 100 total wins, the first to advance to the tournament all four years…and most importantly, the first class to ever reach the Frozen Four. Thank you, seniors. Your contributions have helped pave the way to make Miami hockey one of the nation’s top programs. Some careers will continue in hockey, others, will not. Regardless, we wish you the best of luck in life. Miami will not forget your hard work and devotion to The Brotherhood.